Gene passed away on June 14th at the age of 78. Gene played Centre for 7 years in the CFL., including 5 with the Tiger-Cats (1963-67) where he was a member of the 63, 65 & 67 Grey Cup Champions. Harry passed away on June 9th at the age of 87. 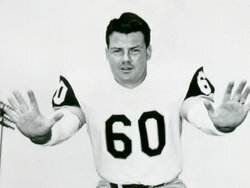 Harry played 9 years in the CFL including 3 (1957-59) with the Tiger-Cats. He was a member of the 1957 Grey Cup Champion team. William passed away at the age of 92 on February 21, 2018, surrounded by his family, at St. Peter's Hospital, Hamilton. Bill played during the 1947 season for the Hamilton Tigers. In his later years, he became actively involved with his beloved Tiger-Cats. He and his wife Connie were married for 64 years and they were a fixture at Tiger-Cats games over the years, where Bill held season tickets for 65 years. Bill was a member of the Hamilton Tiger-Cat Alumni Association executive for many years, which required him to appear at countless community events over the years. He became a tireless promoter of the Hamilton Tiger-Cats. Bill was always a true gentleman in everything he did and a pleasure to know. He will be sorely missed by all his friends in the football community. Gene Ceppetelli passed away on June 14th at the age of 78. Gene played Centre for 7 years in the CFL, including 5 with the Tiger-Cats (1963-67) where he was a member of the 63, 65 & 67 Grey Cup Champions. John passed away on August 2nd at the age of 75. 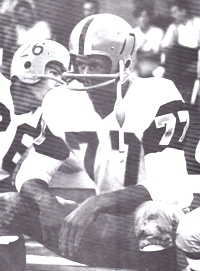 John played Guard for the Tiger-Cats from 1967 – 1973 and was a member of the 1967 and 1972 Grey Cup Champions. John was also a CFL All-Star in 1972. Harry Lampman passed away on June 9th at the age of 87. Harry played “End” for 9 years in the CFL including 3 (1957-59) with the Tiger-Cats. He was a member of the 1957 Grey Cup Champion team. Jim passed away on August 29th at the age of 88. He was a long-time member of the Alumni Association having played junior football with the Tiger-Cats from 1951-57. Lawyer Roger Yachetti passed away on September 16th at the age of 78. Roger assembled a consortium to purchase the Tiger-Cats in 1992 and was instrumental in rebuilding the team’s profile and base of support. He was chairman of the Tiger-Cats from 1992 to 1995, and also served as chair of the board and governor of the Canadian Football League. The HTCAA is sad to announce the passing of Bernie Custis on February 23rd at the age of 88. Bernie was a star quarterback with Syracuse University and was selected by the Cleveland Browns in the 1951 National Football League draft. Told he would play safety with the Browns, he resisted the move and opted to sign with Hamilton. He started every game at quarterback in his first season. He moved to running back the next season and in 1953 helped Hamilton win the Grey Cup championship game. Bernie finished his pro career as a running back with the Ottawa Rough Riders in the 1955-56 season. He later coached at various levels including Burlington Braves of the Canadian Junior Football League, winning three Ontario championships and two Eastern Canadian titles. Over eight seasons as head coach of the McMaster Marauders he compiled a 31–23–1 record. He was named the OUAA Coach of the Year in 1982 and 1984 and was named CIAU Coach of the Year in 1982. He was inducted into the McMaster Athletic Hall of Fame in 2000. He was inducted into the Canadian Football Hall of Fame in 1998 and in 2015 received the league commissioner’s award. Dave passed away suddenly on May 18th at the age of 65. He was a long time Board member and former President of the Hamilton Tiger-Cat Alumni as well as a Board member and Secretary/ Treasurer of the CFLAA and a member of the Tigertown Council. Dave was a star player at the University of Guelph and a Tiger-Cat player in 1975. He will be remembered as a tireless worker helping to support the Tiger-Cat Alumni as well as many other causes in Hamilton in his position of Executive Director of the John Howard Society. Dave volunteered hundreds of hours participating in events like the Alumni Food Drive and Tim Horton’s Camp Day. He was a leader in building support, recruiting sponsors and participants for events like the Annual Tiger-Cat Alumni Golf Tournament and Wall of Honour Dinner. Ellison passed away on February 11that the age of 80. Ellison played for the Tiger-Cats from 1960-1970 and was an 8- time Eastern All-Star, 4-time CFL All-Star as well as an inductee into the Canadian Football Hall of Fame and Wall of Honour. Ellison lived in Hamilton and was a regular at Tiger-Cat events. He was very popular with fans and Alumni and will be fondly remembered. John passed away on February 17, 2015 at the age of 79. John is considered one of the greatest Tiger-Cats of all-time. He has been inducted into the Canadian Football Hall of Fame and the Tiger-Cat Wall of Honour. John played 14 seasons with the Tiger-Cats (1957-70) and was a 4 time Grey Cup Champion and 6 time CFL All-Star. He played both Offensive and Defensive Tackle and was named to the All-Time Tiger-Cat team at both positions. Joe passed away on April 26, 2015 at the age of 70 after a battle with cancer. 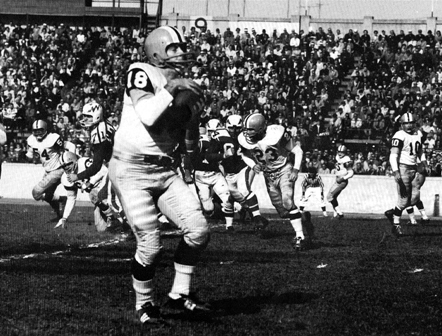 Joe played Tackle for the Tiger-Cats in 1963/64 and was a member of the 1963 Grey Cup Championship team. Beloved "Players Coach" Al Bruno passed away on October 5th, 2014. Al coached the Tiger-Cats from 1983-90 including 3 successive Grey Cup appearances and a Championship in 1986. Al was 87. As a young adult, sports became Walt's focus. In 1951, he left Westdale High School to play junior football with the Hamilton Tiger Cats for 3 years and in was a member of the Dominion Junior Championship team that year. In 1954 he joined the Hamilton Tiger Cats CFL team as Centre and wore number 45 until he was injured and forced to end his professional career in 1956. He remained an active member of the Tiger Cats Alumni. On June 20th, 2014, former Tiger-Cat Asst. Coach Thomas Mooney passed away. Tom had a stellar coaching career at two Canadian universities, played briefly in the CFL, and was an assistant coach for Hamilton Tiger-Cats when they won the Grey Cup in 1972. We are sad to announce the passing of Past Alumni President Art Darch, peacefully at his home on Tuesday, April 2nd at the age of 81. Art was an originating member of the Alumni and long-time member of the Executive Committee. Art Darch was an excellent athlete, and besides playing football was a standout at Track & Field. Art actually turned down a Track & Field Scholarship at Michigan to play football. He joined the Tiger-Cats in 1952 and was quickly a starting Offensive Guard. He remained with the Tiger-Cats through the 1958 season. He missed the 1959 season due to injuries, but came back to play two seasons for the Toronto Argos in1960 and 1961. Len (Pudge) Chandler, 79, of Cornelius, passed away peacefully on Sunday, March 10, 2013, at his home, surrounded by his family, after a brief battle with cancer. Defensive lineman Bruce Smith, who earned a Grey Cup ring with the Hamilton Tiger-Cats before finishing his CFL career with the Toronto Argonauts, has died at the age of 63. Smith had been diagnosed with pancreatic cancer. The Texas native began his CFL career with Hamilton in 1972 and was a member of the Ticats' Grey Cup-winning squad that season. Smith then spent time with Edmonton and Ottawa before arriving in Toronto in 1976. He played four seasons with the Argos (1976-'79) before retiring. Known by many as Mr. Hamilton, Reg passed away on October 21st at the age of 93. Born in Hamilton in 1918, he was well-known at Dofasco, where he worked 46 years and city Alderman for 28 years. He was a member of the Hamilton Tigers in 1939 upon graduating from Westdale High School until the outbreak of WW II. He then joined the Hamilton Flying Wildcats in 1944 where he played as a defensive tackle until 1948. In 2001, he was inducted into Hamilton’s Gallery of Distinction and in 2006, was one of 12 finalists for Greatest Hamiltonian. Former HTCAA President Andy Marshall passed away on January 13th. Andy was born in Hamilton and played junior football with the Brantford Redskins before moving on to the CFL in the mid 50's with both Montreal and Ottawa. QB Bob Torrance who spent the 1993 season with the Hamilton Tiger-Cats passed away on January 10th at the age of 43. Bob also played for the Calgary Stampeders and was well known for his accomplishments with the University of Calgary Dino's. Former Tiger-Cat Head Coach Joe Restic passed away on December 11th at the age of 85. Joe spent eight season as a coach for the Hamilton Tiger-Cats with the last three (68-70) as Head Coach. He was known as a coaching innovator, devising a complex offense known as the multiflex while in Hamilton before taking it to Harvard. Joe spent 23 years at Harward retiring as their longest tenured and winningest Head Coach of All-Time. Tiger-Cat great and Canadian Football Hall of Famer Hal Patterson passed away on November 21st at the age of 79 in his home state of Kansas. Hal spent 7 years in a Tiger-Cat uniform, playing in 6 Grey Cups and winning 3. He was also a 3 time CFL All-star as a Tiger-Cat. In addition to being a Hall of Fame member, Hal was recognized on the Tiger-Cat Walk of Fame and voted as the 13th best player in the TSN Top 50 CFL All-time. 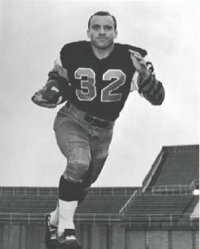 Tiger-Cat great and Canadian Football Hall of Famer Tommy Grant has also passed away at age of 76. Tommy had been attending the Windsor Sports Hall of Fame dinner where he was taken to Windsor Hospital before being transported to London where he passed away on October 18th. He spent 13 years in a Tiger-Cat uniform, playing in 9 Grey Cups and winning 4 of them. In addition to being a Hall of Fame member, Tommy was recognized on the Tiger-Cat Wall of Honour and Walk of Fame. Tom Moulton passed away at the age of 74 on August 25th. Moulton played defensive end with the Tiger-Cats during the 1960-61 seasons. Wacky stories were Moulton's trademark. On February 7th,. Bobby Kuntz passed away at age 79. On March 8th Bronko Nugurski Jr. passed away at age 73. Nagurski arrived in time for the 1959 season and played eight seasons for the Cats, including the ’63 ’65 and '67 Grey Cup winners, He was a CFL all-star in ’62 and ’65 at offensive tackle.